This week’s recipe (which you can find at Food, Family, and Fun), was for a grown-up version of ice cream cake, and grown-up it was. There are three layers of chocolate ganache (involving eight — count ’em, eight — eggs) sandwiching ice cream, in my case coffee ice cream. This was easy enough to make, although waiting for each layer to freeze before adding the next ate up a huge chunk of my morning, and then it has to sit for six hours before you unmold it, and then another half-hour after that. It’s not a last-minute dessert, that’s for sure. But it was so totally worth it. 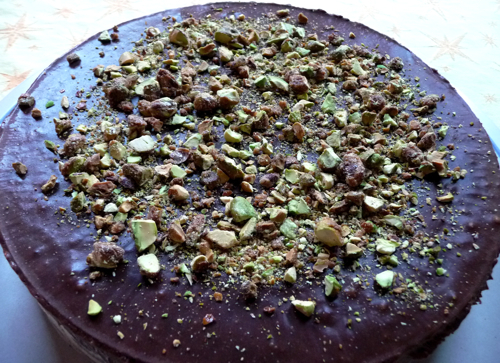 I candied some pistachios, using Dorie’s Candied Nuts recipe, and chopped them up a bit to sprinkle over the top of the torte to make it look pretty. 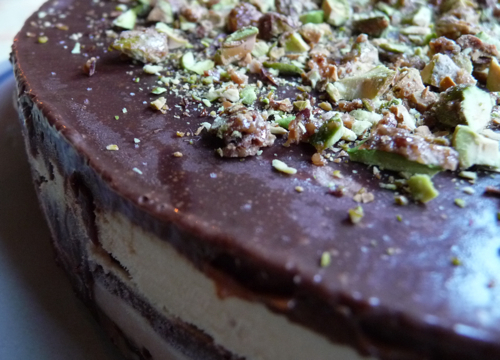 But what really turned out to be sublime was coating each bite of the torte in crushed nuts as if they were jimmies (or sprinkles, depending on where you’re from). It was amazing, easily the best Dorie recipe so far (well, tied with the pudding, anyway). The original recipe called for puréeing raspberries and mixing them with vanilla ice cream. I think I’ll do that next time I’m going to a party and need a knock-’em-dead dessert. I bet it would be great. Check out what all the other TWDers did with their tortes — I’m going to go out on a limb here and say there will be some highly creative variations on this one. This entry was posted Tuesday, August 26th, 2008 at 8:00 am	and is filed under Dorie. You can leave a response, or trackback from your own site. Oohhh – candied pistachios sound amazing. And I have to love coffee in any form, so good work on the flavor combo. Are you for real?! Can that cake be any more gorgeous!??! Coffee ice cream and candied pistachios? You took this to the next level. YUM! Brilliant idea with the nuts. This looks great! 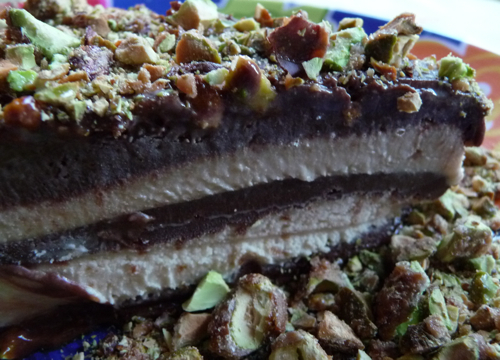 I love the coffee ice cream and candied pistachios! Wow WOw WOw!! Looks great!! So…perfect! Mmmm. candied nuts! That sounds good! Yours looks like you did a great job! Your torte is perfection! Love the candied pistachios for added beauty and crunchy goodness. I used coffee ice cream also, but combined it with Heath crunchies.